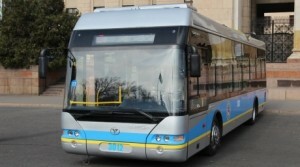 Almaty has over 88 bus routs and 8 trolleybus routes. You can get nearly anywhere in Almaty by using the bus routes. To pay for the bus ride, you will need a top-up card, which you can buy for 400 Tenge (1.19$US) at a kiosk or metro station. The card provides you with one bus ride, you need to top up at least 80 Tenge (0.24$ cents) for another one. Be aware that it takes 15 minutes for your card to recharge, and that you cannot use the same card for more than one person. The card is only valid in Almaty and can also be used for the metro.